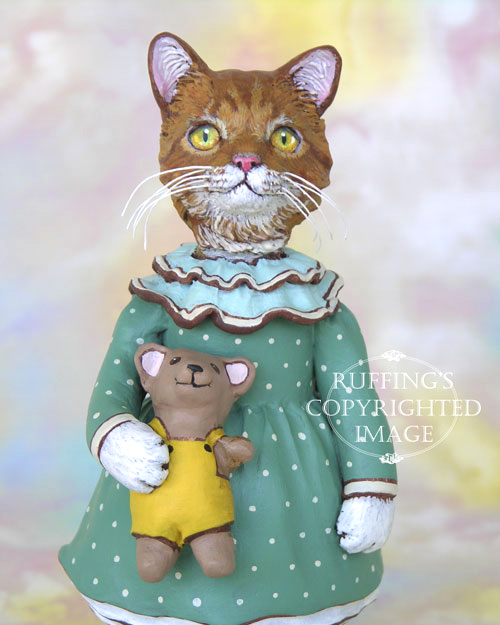 Suzannah is a sweet little ginger tabby cat. This is the year Suzannah was old enough to go to the county fair. 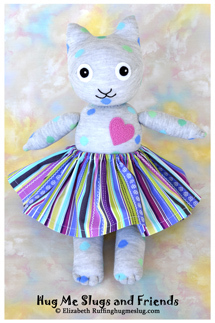 It was love at first sight when Suzannah saw the little prize bear behind the counter. She begged her daddy to throw the ball and knock down the bottles. On the first two tries, he missed. Then, giving her a wink and a nod, he threw the last ball. Down went the bottles! 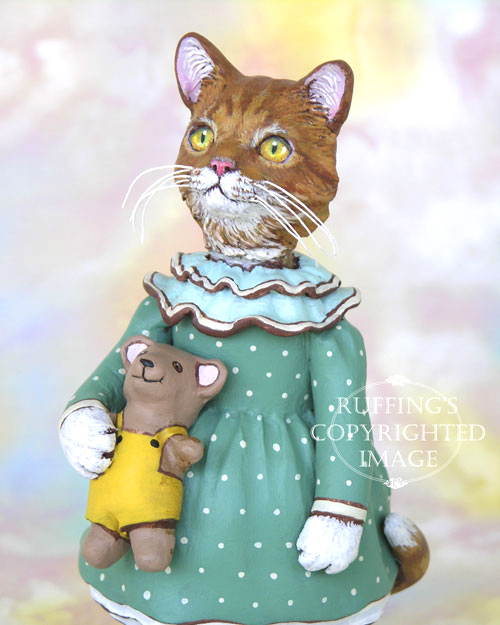 Suzannah squealed with delight and pointed to the cuddly little teddy bear in the yellow overalls. She has cherished him ever since. Suzannah’s dress has a double ruffle at the neckline that has a border of antique white. The big sash tied in a bow at the back matches the blue ruffle. 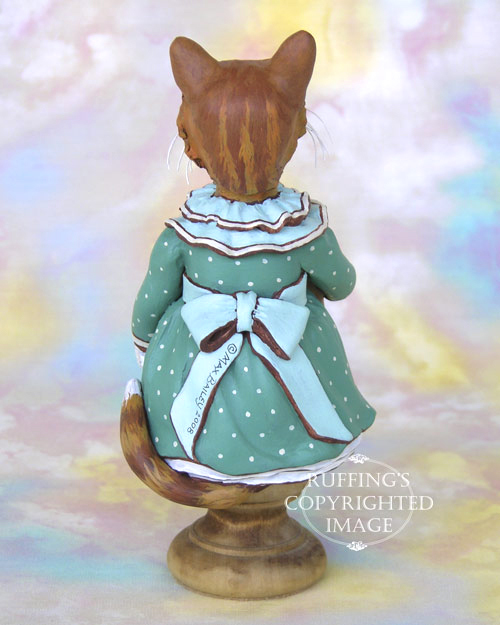 Her dress is a beautiful shade of green with white polka dots, and her white petticoats can be seen below the hemline. 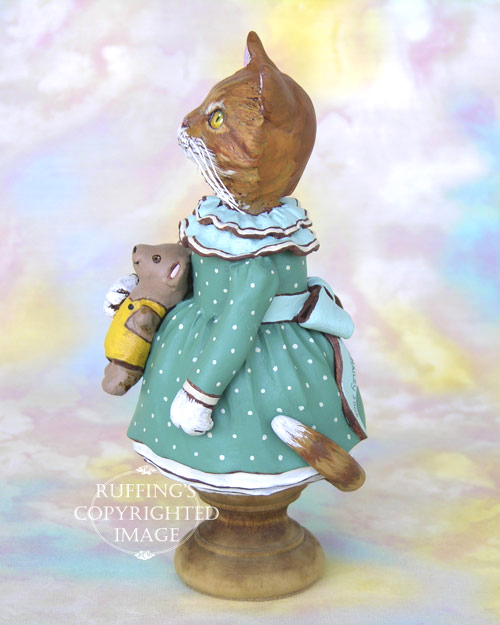 Suzannah is an original one-of-a-kind work of art, and she is meant for display only. No molds are ever used in my work. 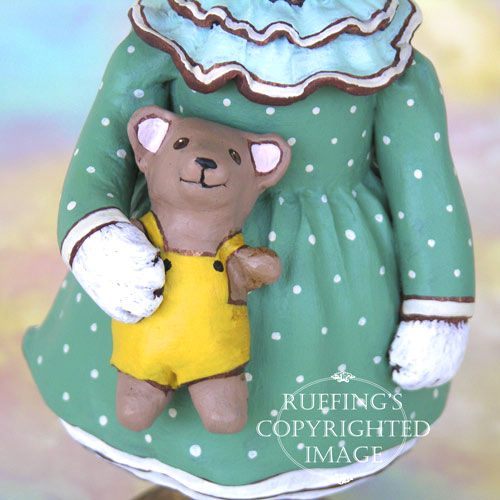 She and her little bear are hand sculpted from paperclay, and entirely hand painted using acrylic paints. 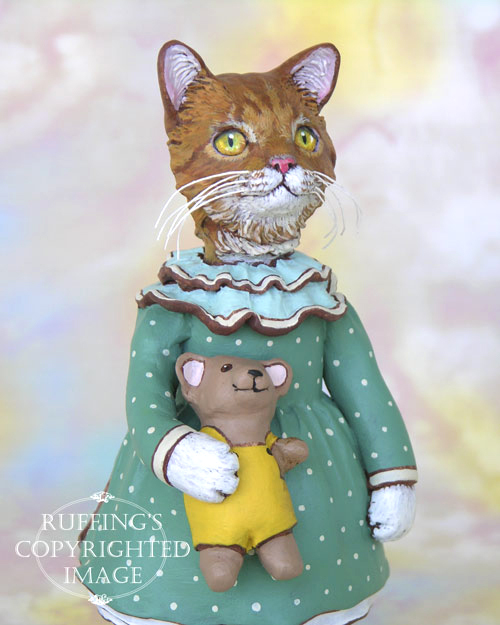 Suzannah’s whiskers are made from stiffened cotton thread. 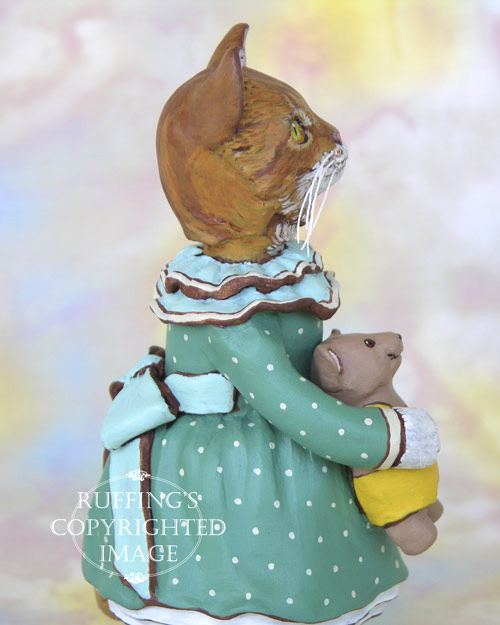 Suzannah is signed and dated, and sealed with matte varnish for protection and preservation. 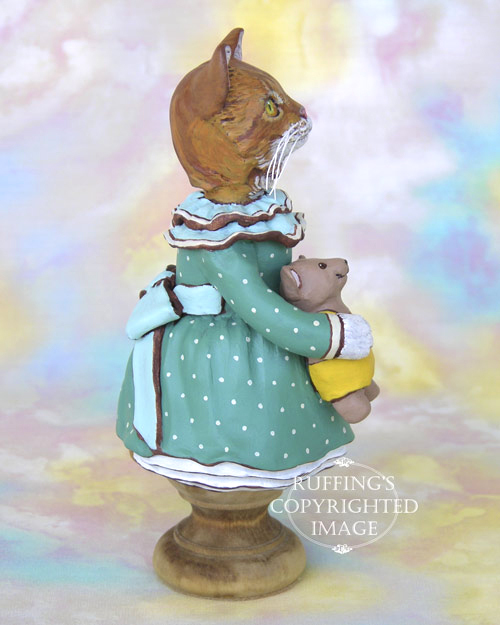 She rests firmly on a turned wooden base that is stained and sealed in golden oak. 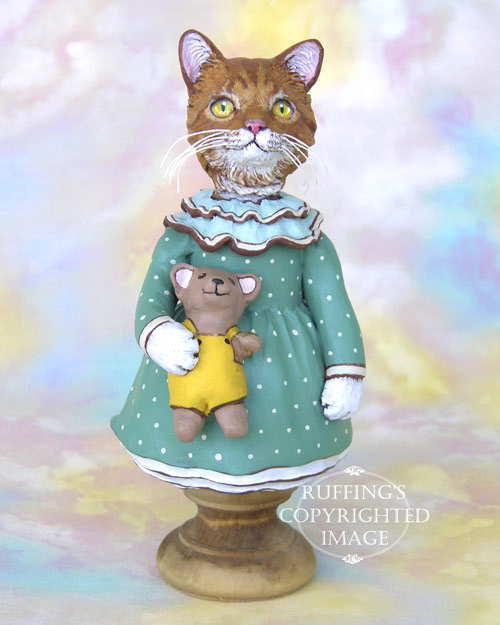 Suzannah stands 6 1/4 inches tall. She comes with a hang tag, a certificate of authenticity, and a copy of her story. 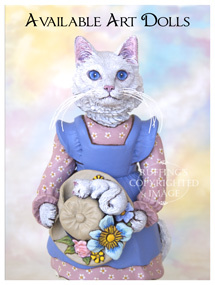 Suzannah is available for $200.00, with free Priority Mail, insured, shipping within the United States. 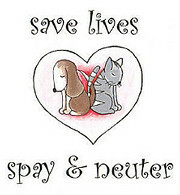 Priority Mail International, insured, is available for $20 to Europe, Australia, Canada, and Mexico. 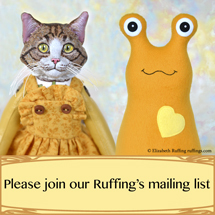 Please inquire to ruffings@ruffings.com or find her in our Ruffing’s Etsy shop by clicking here.